ST TIERNAN’S riders have spoken out against controversial new roles being shoe-horned into Saturday club spins. Last weekend a small group set out for a small ride at a small pace and expected their only stressful moment to be choosing which cake to eat at the coffee stop. 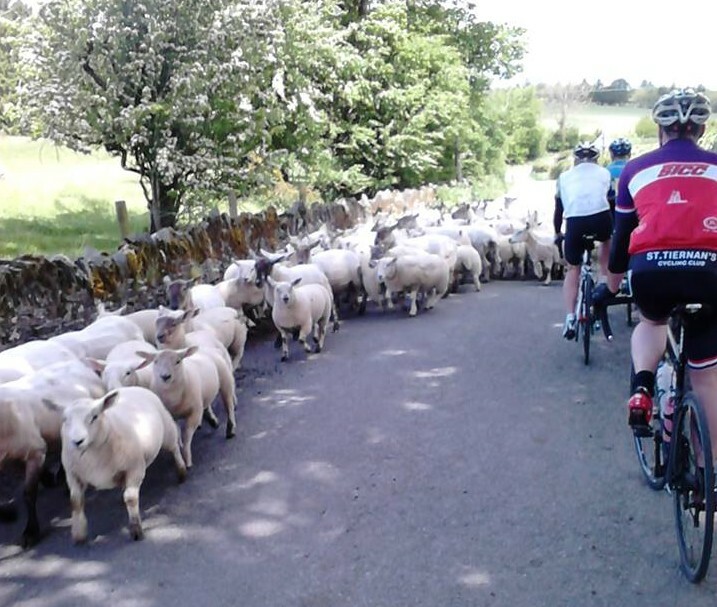 However, it soon became clear that the ride leader, David Corr, had other ideas when he led them towards some farm yard traffic. “Shepherding with Tiernan’s, what could possibly go wrong,” said Lawrence Clifford, after it appearing that the riders were being coerced into assisting the ATV-driving farmers with their herd move. Corr denied all knowledge of being involved in the stunt, which some believe netted the Audaxer a tidy sum. He said: “As we passed the two lads who were shepherding from the ATV, Ciaran Ruane [a club mate] asked them:’Where would you like us to put them?’. In whose bank Corr? Aye. The case remains under consideration for review. No Replies to "Riders speak out on new club spin duties"